Datum point: 2003m (top perforation). Desired production rate: 3500 bfpd. No gas impurities (N2, H2S and Co2). MF1 experienced frequent starts and stops. The theory behind the production capacity calculations was detailed in the post ” ESP design – Step 2: Production Capacity “. It consists on predicting the well inflow performance. The pump intake pressure (1160 psi) is greater than bubble point pressure (964 psi). So that, the Productivity Index (PI) inflow performance method will most probably give satisfactory results. Firstly, we need to calculate the flowing bottomhole pressure (Pwf). Pwf is calculated from the pump intake pressure (PIP), hydrostatic pressure and friction loss in the casing annulus between the pump setting depth and the datum point. In the given example, as the pump is set 290m above the perforations, the friction loss, because of flow of fluid through the annulus from perforations to pump setting depth, is small, as compared to the flowing pressure, and can be neglected. Pwf = PIP + hydrostatic pressure from pump intake depth to the datum. Because there is both water and oil in the produced fluids, it is necessary to calculate a composite SG of the produced fluids. SG is calculated from oil SG and water SG. SG(oil) = 141.5 / (°API+131.5) = 141.5 / (35+131.5) = 0.845. Thus, PI = 2500/(2320.6-1563.8)=3.33 bpd/psi. From the Productivity Index equation, Pwf = Pr – Q/PI = 2320.6 – 3500/3.33 = 1269.5 psi. And PIP = 1269.5 – (1569.8-1160) = 860 psi. At a liquid rate of 3500 bfpd, the PIP is a bit smaller than the bubble point pressure (964 psi). Therefore, the Productivity Index (PI) inflow performance method will most probably give satisfactory results. It is essential to determine the percentage of free gas by volume at the pumping conditions in order to select the proper pump and gas handling device (if required). All equations used in this section were detailed in the post “ESP design – Step 3: Gas Calculations”. In this third step, one must determine The total fluid volume (Vt) of oil, water, and gas at the pump intake. For this example, Standing’s correlationwas used (Standing is the oldest, simplest and most commonly used correlation). To determine the solution GOR (Rs) at the pump-intake pressure, we need to substitute the pump-intake pressure for the pressure (P) in Standing’s equation. For this example, motor temperature is 70 °C (158 °F). The oil formation volume factor is defined as the ratio of the volume of oil (plus the gas in solution) at any specified temperature and pressure to the volume of oil at standard conditions. Bo = 1.131 bbl/stb @ 860 psi pump intake pressure. Bg the volume, in barrels, that one thousand Standard. cubic feet of gas would occupy at some specific pressure and temperature. It indicates how much the gas volumetrically compresses when taken from Standard conditions (60 ºF, 1 atm) to any other specific conditions. Bg = 3.085 bbl/Mscf @ 860 psi pump intake pressure. Now, these three variables: Rs, Bo, and Bg are known. So that, the volumes of oil, water, and free gas can be determined and percentages of each calculated. [Oil rate]: stock tank barrels per day. The free gas equals the total gas minus the solution gas. The difference represents the volume of free gas released from solution by the decrease in pressure from bubble point pressure of 964 psi to the pump-intake pressure of 860 psi. This is a negligible amount of gas, it is expected that pump performance will not be affected by gas, so no need for a gas separator (for more details, refer to the post: ” ESP: Pump Intake “). Now, we know the total volume of fluid entering the first pump stage (3556,1 bfpd) as well as the composite SG (0.997). we can continue to the next step of the ESP system design. As detailed in the article “Step 4: Total Dynamic Head”, the total pump head refers to feet (meters) of liquid being pumped. TDH is calculated to be the sum of: net well lift (the net vertical distance ﬂuid must be lifted from an operating ﬂuid level in the well), HL; well-tubing friction loss, Ft; and wellhead pressure head, Hwh. NB: Giuseppe’s comment on this article, is to be considered for the subsequent calculation steps below. Many methods are available to calculate frictional pressure losses. They range from simple empirical equations to rigorous mechanistic multiphase flow models. The ESP industry has traditionally used the Hazen-Williams formula to calculate these friction losses (in terms of head, not pressure). The Hazen-Williams formula is an empirical equation developed for municipal water distribution systems. It works reasonably well when water is the flowing medium. However, it should not be used to calculate friction losses in viscous or gassy fluids. NB: The TDH required is based on normal pumping conditions. If the well is killed with a heavier-gravity fluid, a higher head is required to pump the fluid out, until the well is stabilized on its normal production. Therefore, more horsepower is required to lift the heavier kill fluid. This should be considered when selecting the motor rating for the application. From the manufacturer’s catalog information, select the pump type which will be operating within the recommended operating range and with the highest efficiency at the calculated capacity 3556 bfpd (565 m3/d). The expected production profile of the well has to be covered by the operating range of the pump during the expected ESP run life. 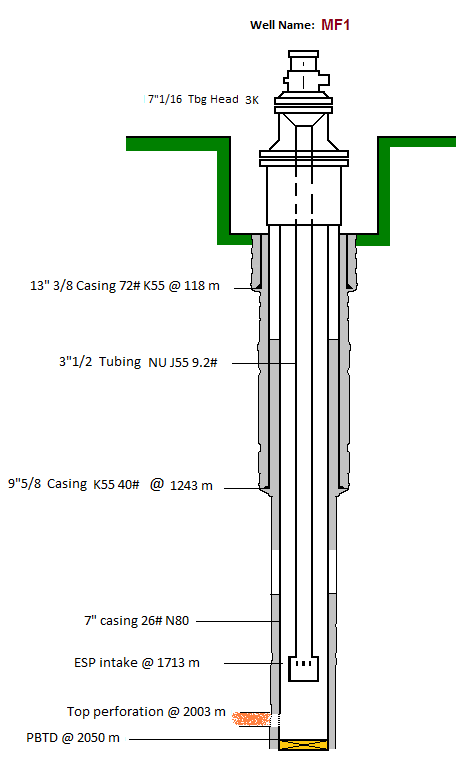 Obviously, the pump ID (series) must fit the 7” 26# casing (ID = 7.276″). 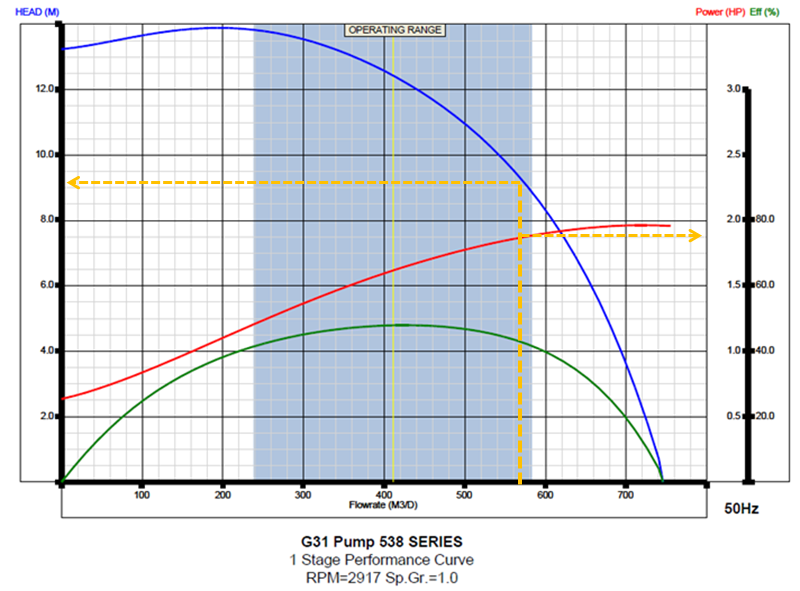 Select the 538 series G31 pump. NB: When two or more pump types have similar efficiencies at the desired production rate, refer to the post titled “ESP design – Step 5: Pump Type”to get recommendations on the most adaptable pump to be considered. 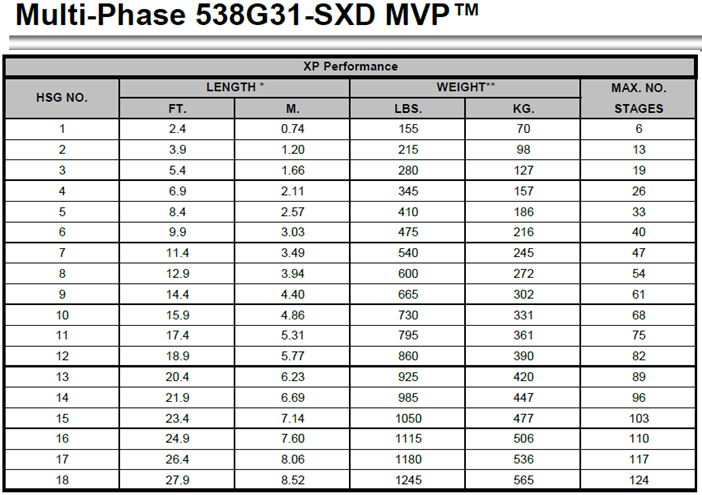 From the selected pump performance curve, The head in meters for one stage at 565 m3/d (3556 bfpd) is 8.6 m (28.2 ft). The BHP per stage is 1.875 hp. Total number of stages required = (3357.19 /28.1) = 120 stages. Stages required = 120 stages. From manufacturer’s information for the Series 538 G31 pump. The housing no. 17 can house a maximum of 117 stages, 124 stages for a housing no. 18. Either housing no. 17 or 18 should be adequate. In our case, housing no. 18 is selected. The theory behind this step was detailed in the post “ESP design – Step 6: Optimum Size of Compounds”. Actually, ESP downhole compounds have different sizes and can be assembled in a variety of combinations. These combinations must be carefully selected to operate the ESP within production requirement, downhole conditions, material strength, and temperature limits, etc. As calculated in the “Step 3: Gas Calculations” in this post, the percentage of free gas was negligible (0.29% of the total volume of fluids at the pump intake). So that, no need for a gas separator. It is preferable to select a Seal series the same as that of the pump and the motor. Otherwise, an adaptor is required to connect the units together. From the manufacturer’s catalog, the 513 series GSB3 DB HL (double-bag, high load thrust bearing) [ESP Motor Seal] seal section is selected for this well MF1. The HP required for the seal depends on the TDH produced by the pump and has to be added to the HP required for the pump. 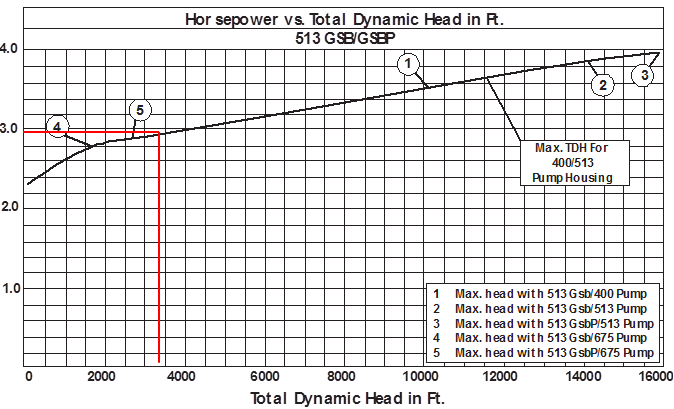 The following Horsepower vs. TDH curve shows a requirement of 2.95 hp for the 513 Series seal operating against a TDH of 3357.19 ft. When selecting a motor, consideration should be given to choosing as large motor as possible for the casing to optimize the initial cost, motor efficiency, operating cost and ensure better motor cooling (higher fluid velocity). As mentioned in Step 1: Input Data, MF1 experienced frequent starts and stops. This is why, from the manufacturer’s catalog, we selected an XP motor which is suggested for wells with frequent starts and stops. Select the 333-hp 562 Series motor from the catalog. The motor voltage can be selected on the basis of considerations discussed in the post “ESP design – Step 6: Optimum Size of Compounds”. For this example, (333 hp; 2321 V; 88 amps) seems to be a good choice. Check the manufacturer’s catalog and equipment information to assure that all operating parameters are well within their recommended ranges (e.g. shaft HP, housing burst pressure, and fluid velocity). Typically, the motor is selected to operate in the range from 70 to 100% of its rating. Generally speaking, the maximum motor load should not exceed 110%, in the other hand selecting a motor with minimum operating load (e.g. 10% or 20%) nullifies the protection monitoring of the motor. As discussed in the previous post: “ESP design – Step 7: Electric Cables”, Cable selection involves the determination of Cable Size, Type and Length. Refer to the manufacturer’s cable catalog to determine if the size selected can be used within the proposed tubing and casing sizes. Cable diameter plus tubing-collar diameter will need to be less than the inside diameter of the casing. In our case, all cable sizes can be used. The cable size is selected based on its current carrying capability. 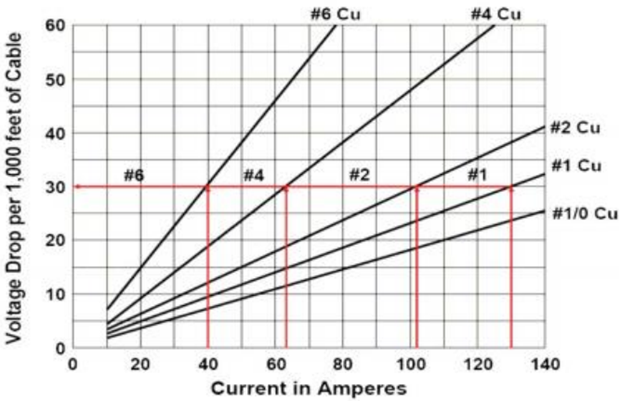 Using the motor amps (88) and the following cable voltage drop chart, select a cable size with a voltage drop of less than 30 volts per 1,000 ft. Conductor sizes #1 and #2 fall in this category. Cables #1 and #2 have voltage drop of 26 volts/1,000 ft and 20 volt/1000 ft @ 25°C (77°F) respectively. Calculate their voltage drop at the downhole temperature (158°F in our case). The cable #1 is selected for this well. As per the input data, the downhole conditions of this well aren’t considered severe (no risk of corrosion, no sour gases, downhole temperature not high..). So that a standard cable type is selected (with galvanized steel armor). Refer to the manufacturer’s catalog for more details. The pump setting depth is 5620 ft (1713 m). With 100 ft (30.5 m) of cable for surface connections, the total cable length should be 5720 ft (1743.5 m). As discussed in the previous post: “Step 8 – Downhole and Surface Accessory Equipment” the required downhole and surface accessory equipment are described in this step 8.
select a standard length of 50 ft (15.24 m) flat cable (AWG: 2, Armor: Galv.). Install three bands per section from the motor pothead to the first splice in the power cable (don’t install bands on a cable splice). Place a band above and below the splice approximately 4 inches. Cross-Coupling Cable Protectors are used to protect and support ESP cable. Install a cross-coupling protector every 10 joints. Select these accessories on the basis of required ODs and type of threads. The motor-controller selection is based on its voltage, amperage, and KVA rating. Therefore, before selecting the controller, one must first determine the motor controller voltage. The surface voltage (SV) is the sum of the motor voltage and the total voltage loss in the cable. Taps on the transformer have to be adjusted to closely achieve this value. Surface Voltage = 2321 + [(23.46 Volt/1000 ft × 5720 ft)] = 2455 V.
Surface Voltage = 2455 V.
NB: Surface voltage is less than standard 3 KV cable. 3 kV or higher cable construction can be selected. For this example, a 4 kV power cable is selected. The motor amperage is 88 amps; the KVA can now be calculated. The 380V motor controller: model: 4500-VT (411 KVA / 624 A) suits these requirements. The transformer selection is based on the available primary power supply (418 V), the secondary voltage requirement (2455 V) and the KVA requirement (374 KVA). The 452 KVA Step-Up transformer (C86554) suits these requirements. Select 50 ft (15.2 m) of no. 1 cable for surface connection to transformers. As discussed in the previous post: “Step 9 – Variable Speed Submersible Pumping System”, the most important benefit of using a VSD is the wide flexibility of the variable frequency ESP system. This permits perfect matching of the lift capacity of the ESP system and the well’s productivity. Therefore, it operates over a much broader range of capacity, head, and efficiency.